I WAS BEING CHEAP WITH MY TRAVEL PLANS & DECIDED TO STAY 21 HOURS IN REYKJAVIK, ICELAND...AND I AM SO GLAD THAT I DID. when do i go back? It's middle of winter in Iceland, it actually wasn't as cold as I was expecting, but the darkness & bitter air is going to have you craving coffee, soup, and/or something to heat you from the inside out. te & Kaffi :: for your tea and coffee ;) There's a few of them around town. 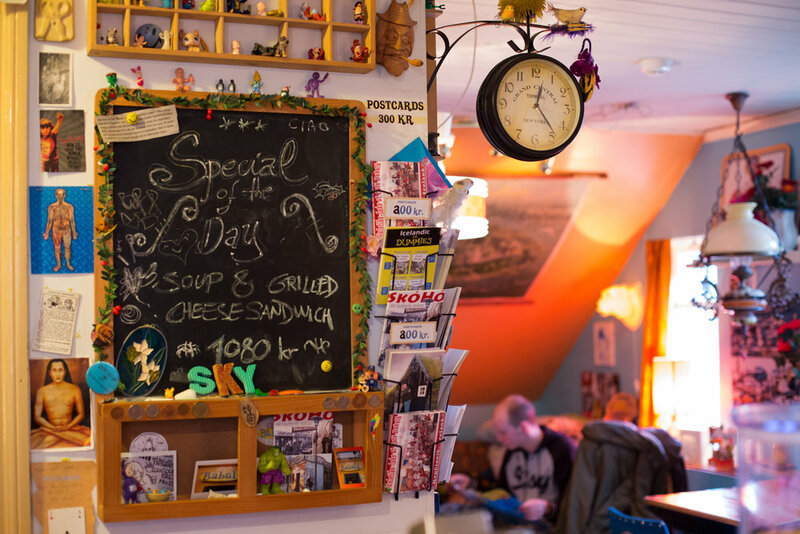 cafe babalu :: hole in the wall cozy vibe, I had the lamb stew, it hit the spot but they offer loads of vegan & vegetarian specialties. i almost had the vegan carrot cake but refrained. iceland phallological museum :: yes this one shocked me as well. AIRBNB :: Central to downtown, this is sort of a shared inn / bed and breakfast style Airbnb. Awesome location & the host is extremely accommodating but expect to meet other travelers. Clean crisp style, pops of color, handmade sweaters, lamb or sheep wool everything, style from furniture to fine art this place has it all. It reminded me if Portland had a magic baby with British Columbia and Sweden, then put it on an island, you may find Iceland. fly bus :: I highly recommend taking a bus to and from the airport to downtown (45 minutes), it was about 26 euro & they will drop you directly at your hotel or airbnb. if you take a taxi from the airport it may cost you almost $100 one way. Fly bus also takes you from downtown to blue lagoon to the airport. buy tickets online. rent a car :: I recommend. careful in the snow. blue lagoon :: book online way in advance! the northern lights :: if you want to see them clearly you will most likely have to leave the city because the light pollution makes it hard to see. wifi :: there's free unprotected passcode wifi almost everywhere, even the airport has great all around wifi for you to actually get work done on your laptop. christmas time :: they really go for it and decorate the entire city to make you feel as if you've made it to some version of the north pole.